I'll confess that hacking of that sort feels to me a little out of place in the environments that we've seen thus far, but that may be a passing feeling, or I might be in the minority in feeling so. The site-mockup looks good, to my eye--appropriately "corporate", I think. Hi everyone, Ricardo here with an update on the visual work we've been doing as of late. 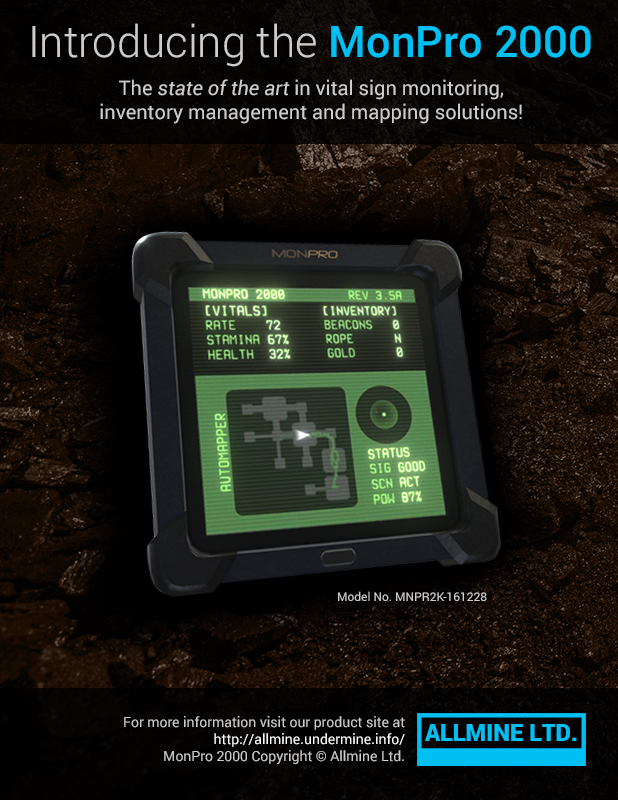 As Adam said in an earlier post, this week we wanted to focus on marketing and promotion for the game and we created a small website for the in-game HUD/map: the MonPro 2000. As part of this project I worked on tweaking the model and textures of the MonPro 2000 device for Sketchfab and embedding it to the microsite. You can check out my profile here for the MonPro 2000 model and other Undermine related work, since I can't embed directly in this board. 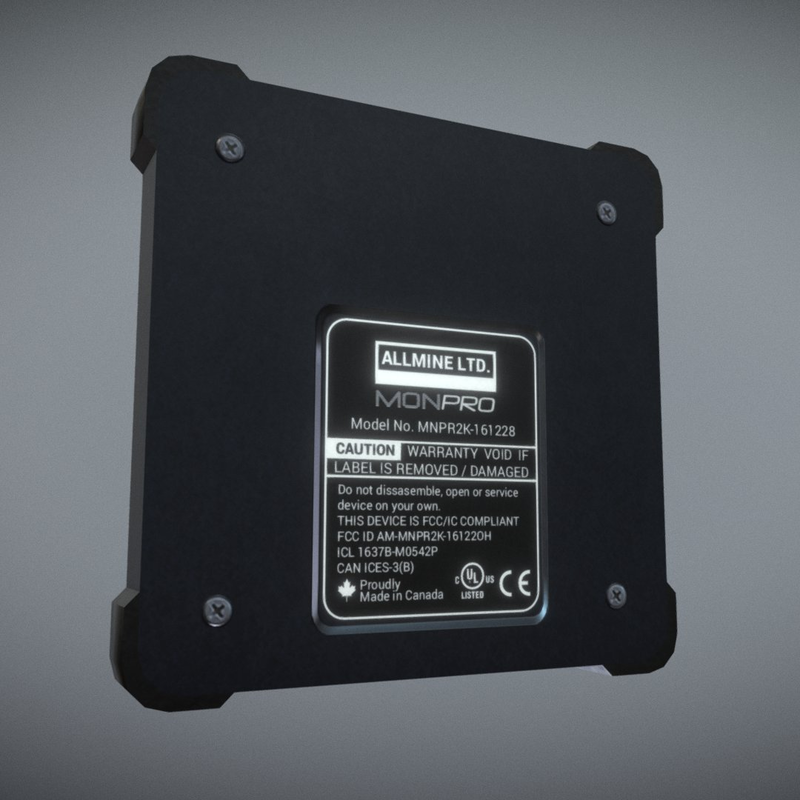 Adam also suggested an additional improvement after looking at the model in Sketchfab: adding a label to the back of the device, and I must say it looks pretty neat. Even if this won't probably appear in-game, we're probably going to update the game textures too (it might be useful if we decide to spice up the inventory screen with rotating 3D models instead of bitmaps). Additionally, as extras for the microsite, we've been working on a promotional image for the microsite, and Adam has been working on a minigame which is basically a simplified top-down representation of the exploration and beacon mechanics in Undermine with some slight differences. The idea is to have some engaging activities for visitors of the microsite. As you can see above, the minigame lets you throw the beacons in a similar fashion as the game, the idea is that you use them to determine if a room/corridor is safe. In the second animation you can see the enemies moving around their patrol paths. Unlike the main game's procedural level generation, the minigame will probably feature a few handcrafted levels. 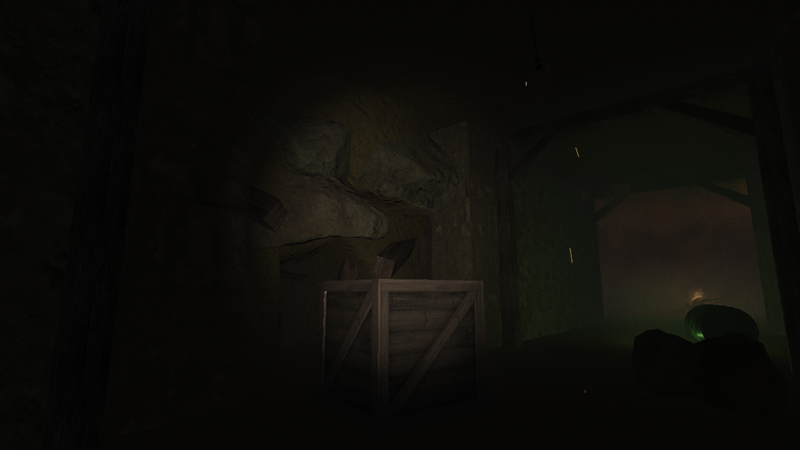 And finally, some work has been done to improve collapsed tunnel connectors and wood textures. This is ongoing work but the new connector modules already help break those dreaded 90 degree angles everywhere. Well, this is it for now. As always, any feedback and comments are appreciated. Ricardo out. I'm glad you like it. I must admit I'm feeling pretty well about how my 3D skills have improved since I started to work on this project. Before that I just dabbled here and there with 3D modeling and texturing but I've learned a lot and gotten better while applying those skills for Undermine. 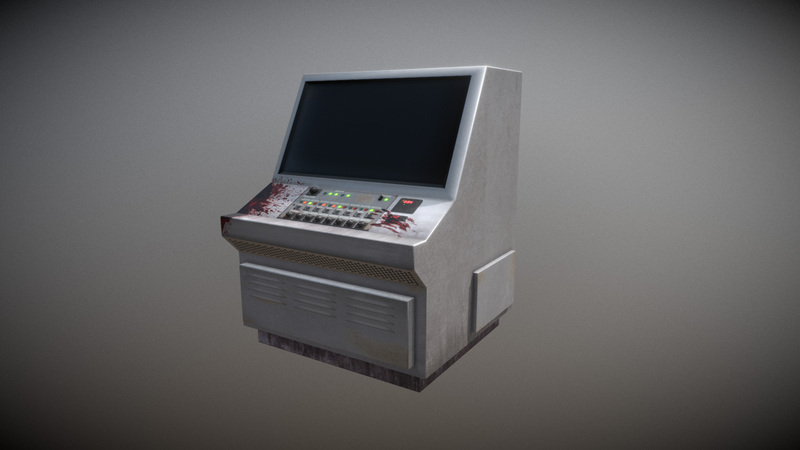 I put a few more hours into the console and improved the model and textures even more. Added some blood (can't have enough blood in an horror game I guess) and more details to the texture maps. As to improvement, I've found similarly myself: I've learned a number of tricks over the course of my project thus far, and do think that I'm (slowly) improving as a modeller. Yeah it's quite rewarding to see concrete improvement. As for the minigame and finished microsite, I'm quite confident it's going to be rather soon. I believe Adam will write a post about this to let you guys know when it's published. I was talking with him about the minigame, I think it's too good to be just forgotten in a website and suggested we embed it inside the in-game MonPro, but Adam is not sure he want's to add it since it's quite similar to the main game, but we might do something else with it, still figuring it out. You could simply make the minigame available from the game's main menu as a little side-game. If you want to, you could require that it be unlocked somehow. Must have missed an update somewhere along the way, because I hadn't gotten any alerts from this - decided to drop back in and wow! Great progress, this is really taking shape. Watched your last video update from a few weeks ago, and I think the new levels definitely do look better, even with sacrificing the more organic level design. Once you add in a few of the other touches you talked about, I think they will look fine. The only major pitfall I personally see from this approach is trying to keep the modules from linking up in too predictable of a pattern; like, if Module X almost ALWAYS leads to module Y, the players get used to that, expect it, and now they feel somewhat safe and comfortable, and you may lose some of the uncertainty of the horror aspect. Hey there Pixel Noise, welcome back to the devlog! The game has definitely improved a lot in various aspects, some of which are very hard to show since they are not necessarily visual, although the visual department has received a fair bit of attention too. The new generation logic explained in the video update is perhaps the biggest change so far and while we were a bit reluctant it was totally a gamechanger and in a good way. Currently the variety of modules and the generation works reasonably well avoiding repeating patterns and this will probably get even better down the line as we add further variations and tweak generation. But so far it's a massive improvement over the often chaotic old generation logic. A small update: I bought Quixel Suite and will put it to good use in improving the texture maps for our different assets. So far I've been using Photoshop and Nvidia's plugin for generating normal maps and well, the workflow is not that great. This new tool will probably aid me a lot, still need to learn more about its usage and features but I spend a few hours yesterday experimenting and so far = mindblown. If anyone is interested they have a 40% discount running right now. 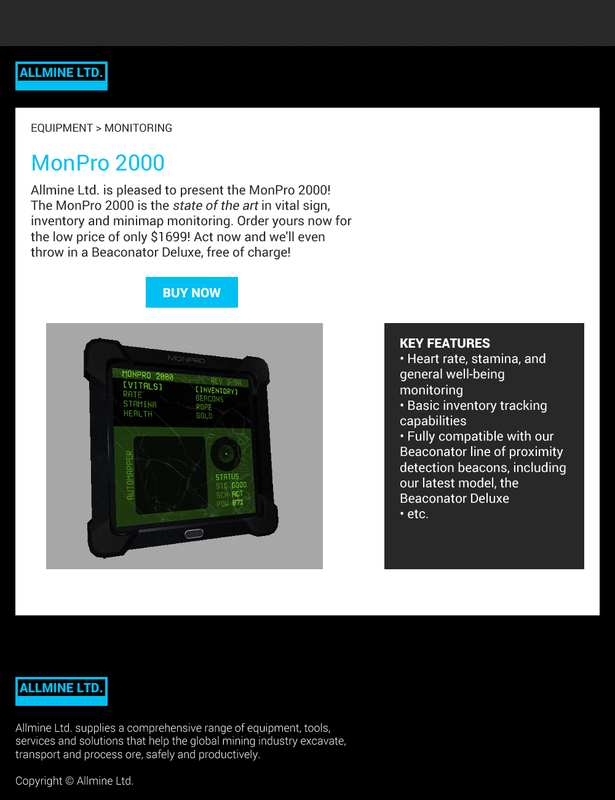 Ricardo here bringing you a small update to share with you all the official (heh) Allmine Ltd. MonPro 2000 product site! 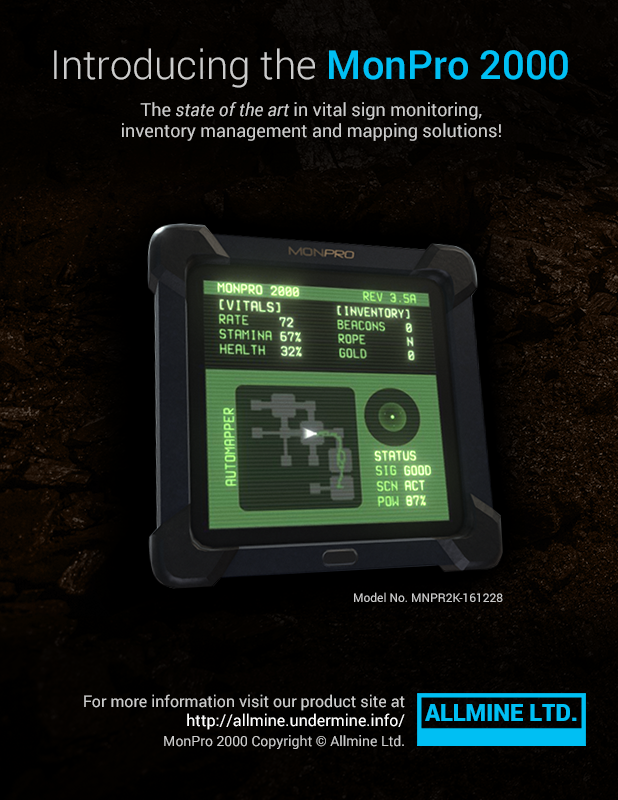 Check it out, read the specs, gander at the 3D model and try the interactive demo. As always, feedback is appreciated and if you're so inclined, sharing is caring! Glad you liked it. It's part of a small marketing experiment/test, since we're exploring other avenues to increase the presence of the game on the web and reach our potential audience. We'll see how it goes! Hmm... I wonder whether it might not be worth making the first level or so a little easier, and to have it slowly introduce the skills called for in the game? That might produce a smoother introduction to the game, and make it easier for players to get into it. On my first attempts, I recall having enemies suddenly sprint at me, seemingly from nowhere, because I hadn't yet learned how to cautiously detect them. Perhaps the enemies--or early ones, at least--might pause slightly and produce some effect to indicate that they've seen the player (a noise and a pulse of their scaling, perhaps). That might give the player a chance to escape after a mistake. Another thought might be to have the player's vision-radius start out fairly large, and gradually shrink to its current level. However, this might be thematically odd: it seems that we start out at the lowest level, and move upwards, making a decrease in light feel back-to-front. As to learning the enemy routes, that can be tricky when they're often only briefly seen, and intermittently at that. It's doable, but again, I suspect that the game might want for an easier introduction to this concept. When I first played the demo and got attacked by two "skulls and crossbones", it felt like I was *molested* by them. My impression of the game is similar to Thaumaturge's and is different from what I'd expect from a survival horror type game. The "omni-vision" and superfast movement of the enemies make the game more like a SUPER-stealth game. Yes, it's possible to observe the movement of the enemies, but if you start moving and happen to be close to one on patrol near a beacon or run into one in later on then due to their speed, you have very little chance to escape. There's very little chance for error and you have to be strategic and "wait and observe" more. It's also more like walking on an insta-kill minefield rather than in a jungle where you are the prey and you have a reasonable chance of escape if you are careful because you have to be very, very careful. Survival horror to me would be between stealth and action. Sure, you'd have to be careful and can't just run around, but with the current speed of the enemies, you know that if one of them spots you, it'll be easily catch up to and start attacking you. One of the important elements of horror is the chase. Can you make it to another safe place before the enemy catches you? Especially, when the enemy has spotted you and is chasing you. That creates an on-going tension and release if you make it vs the almost insta-kill effect that is over quickly when a superfast enemy catches you in an instant. It would be similar to "tense horror" vs "cheap jump scare". As a balancing consideration, enemies could be slower but their attack could be more damaging. That reminds me of movie related video I saw on youtube regarding the misuse of "the throw". If a powerful character is trying to kill another character, when it throws their target, the target (usually) doesn't die, but has a chance to escape or fight back. That tends to decrease the perceived threat/power of the character. Similarly, there is the "touch". If a powerful character touches the target, then you'd expect it to be over for the target. Similarly, in your game the enemies could be slightly slower but each of their attacks would be more damaging. That would keep their threat level high. I'm wondering how close representative is the 2d version of the game to the 3d? When I first started playing, I expected the enemies to only "see" in their direction of movement. But then I thought that if they can hear, then it would be reasonable that they know when you move. However, in either case, it might be better if they do a little "investigation" first (i.e. turn and look around) rather than instantly jump and move toward the source of sound. Similarly, if enemies are alerted by sound then when you throw a beacon nearby enemy could investigate it for a bit then continue on it's patrol. I wonder about the red beacon color when an enemy is nearby. For some reason, it was a little immersion breaking for me. I know it would makes sense as an extra help for playing the game, as it currently is since bumping into the "superfast" enemies leaves little chance for finding a new safe place or even returning to where you were. However, if there's more chance of making it, then it may not be necessary. Just a thought. More distant beacon pings could have lower volume. Thanks for the comments guys. Both you Thaumaturge and io3 creations make good points. I want to be clear that the minigame and the full game are quite different and while they share some ideas and style considerations the mechanics are quite different in several aspects. To give you both some specifics: The minigame is more of an arcade-ish experience, and enemies work differently. They have patrol paths and only rush towards the player when you approach them. In the full game enemies wander around the level, you can alert them by being noisy. In the full game you can attack and kill the enemies, while in the minigame you can only push them back a bit with the beacons. The beacon light turning red when a threat is in proximity is also present in the full game (as you can see in some of the screenshots we have on our website), honestly didn't think much about it. It is indeed a way to give a visual cue to players about incoming danger. Also beacon ping sounds louder when near them in the full game. Adam has done an amazing job with the sound direction of the game (I might be biased but I really like the sound work in this game heh). Once again, thanks for the feedback, this always gives us food for thought and keep improving the game. See you all around. I see. In that case, while having less features than the full game is reasonable, I still wonder about the speed on the enemies. If the enemies in the full game move slower then that could give a very different impression of the game. Similarly, (only skimmed through the devlog and might have been answered) will there be slower/faster enemies in the full game? Starting with slower enemies might be more beneficial for new players in the demo also. In terms of marketing, if someone comes across the demo webpage or game, there doesn't seem to be anything linking it to the Undermine game. If I was coming across the demo without prior knowledge of Undermine, I'd think it's an actual ad for a product called *MonPro 2000*.